I know I've been writing a lot about marriage here lately, but my friend Jessie got married last weekend, and it was quite the celebration. 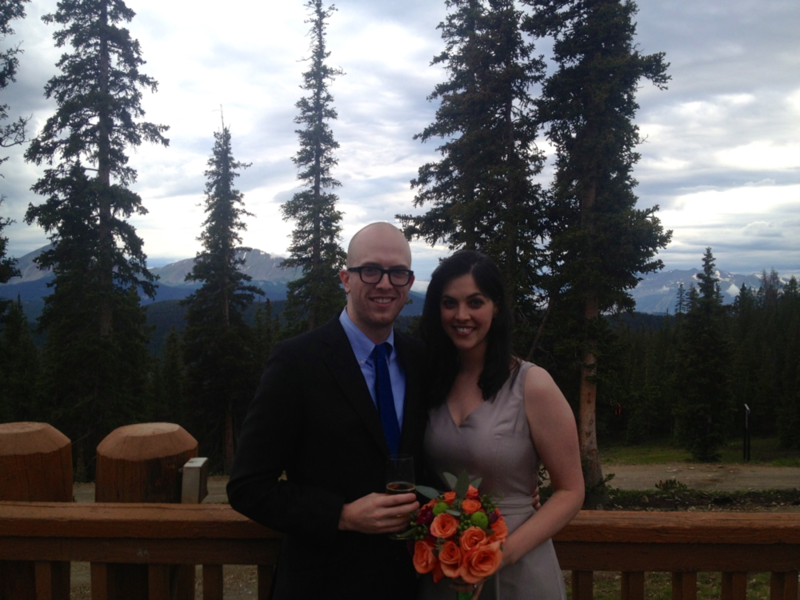 The ceremony and reception took place at the top of a mountain in Keystone, and I had the honor of being one of the bridesmaids. Dann and I also got to ride the gondola down the mountain in the dark together, which was terrifying and hilarious and one of the coolest things I've ever experienced. I’ve been friends with Jessie since 6th or 7th grade, and she is one of the most loyal, thoughtful people I know. Jessie's sister Jenny pointed out during her toast, that when you mention to Jessie that you like something (even briefly, in passing), Jessie will later show up with the thing in her hand to give you as a gift. She remembers details, she pays attention when she listens, and she cares deeply about the people she loves. She’s a truly good friend. She was a stunning bride. When Jessie’s husband (!!) Max emailed me a couple of years ago to ask if I would take a secret photo of the two of them running in the park, I felt honored and then immediately nervous that I maybe wasn’t up to the task. Dann helped, and together we pulled off the shot below, which Max had printed on a canvas and gave to Jessie as a surprise Christmas gift that year. I knew then that Max would make a good mate and that he has what it takes to keep Jessie on her toes, which is no easy task. As I’ve watched their relationship progress over the last few years, one thing has emerged as certain between Max and Jessie; they will fight for each other. They want to be together, they’re willing to make sacrifices for one another, and they've already proven that together they can overcome some pretty serious challenges. I have total confidence that they will be better together as husband and wife, and I’m so excited for them to grow deeper in love in the years to come. One of the readings during the wedding ceremony was the e.e. cummings poem below. It makes me weep every time I hear it. Here's to Max and Jessie and the wonder that's keeping the stars apart.